The pace of production in the auto industry is picking up: According to Bloomberg.com, “The U.S. auto market is poised for a fifth straight year of growth for just the second time since World War II.” Growth in the auto industry means production and growth in the plastics industry will soon follow suit. Auto sales are expected to continue to increase through next year, and this will drive demand for more extruded plastic products. Why? Because (and you may be surprised by this fact), according to the American Chemistry Council (ACC), plastics make up more than half of the volume of the average automobile produced today! The ACC says plastics “hold the key to a host of safety and performance breakthroughs in today’s cars, minivans, pickups and SUVs.” The ACC also notes that while today’s plastics make up 50 percent of the volume of new cars, plastics only account for 10 percent of the weight. It’s the light-weight nature of plastics, the versatility and the innovative design capabilities of plastics that all contribute to the safety and performance features and fuel efficiency consumers expect from the automobiles they buy today. Auto manufacturers have a lot of choices when it comes to selecting the materials used for extruded plastic products for auto designs and projects. How the plastic components are used (their applications) typically are what dictate the types of materials selected to make plastic extrusions. 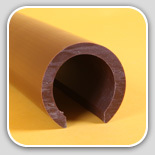 Flexible PVC (Poly Vinyl Chloride) – because it offers excellent resistance to water and aqueous solutions, flexible PVC is used for door and window components, fabric coating, extruded wire covering and pipe. TPO (Thermal Plastic Olefin) – TPO was designed primarily for automotive exterior ornamentation applications requiring low thermal expansion characteristics and a moderate degree of flexibility. PP or Glass-Filled PP (Polypropylene) – selected for its strength, impact resistance and high-temperature capabilities, and often used for electrical applications. Glass reinforced polypropylene compounds are used in structural components that require higher levels of stiffness, strength and heat resistance. ABS (Acrylonitrile-Butadine-Styrene) – a terpolymer of acrylonitrile, butadiene and styrene, ABS is typically used for automotive hardware, pipe and plated items. If you have any questions about extruded plastic components, polymers and compounds, or more specific information about each of the polymers mentioned in this post –please don’t hesitate to ask! This entry was posted in Polymers and tagged acrylonitrile-butadine-styrene, Auto Manufacturing Industry, Extruded Plastic Products, means production and growth in the plastics industry, poly vinyl chloride, Polymer, polypropylene, Santoprene, thermal plastic olefin. Bookmark the permalink.